Majority In House Supports Abortion Rights, But Senate Is Another Story : Shots - Health News Members of the new Democratic majority in the House vow to reverse restrictions that Republicans have imposed on abortions. But the efforts could lead to titanic fights that imperil other legislation. At an October news conference, the Congressional Pro-Choice Caucus called on President Trump to reverse the administration's moves to limit women's access to birth control. Rep. Diana DeGette, D-Colo., spoke at the lectern during the event on Capitol Hill. For the first time since the Supreme Court legalized abortion nationwide in its 1973 Roe v. Wade decision, the House of Representatives has a majority supporting abortion rights. And that majority is already making its position felt, setting up what could be a series of long and drawn-out fights with a Senate opposed to abortion and stalling what could otherwise be bipartisan bills. Democrats have held majorities in the House for more than half of the years since abortion became a national political issue in the 1970s, but those majorities included a significant number of Democrats who opposed abortion or had mixed voting records on the issue. A fight among Democrats over abortion very nearly derailed the Affordable Care Act as it was becoming law in 2010. This new Democratic majority is more liberal — at least on reproductive rights for women — than its predecessors. 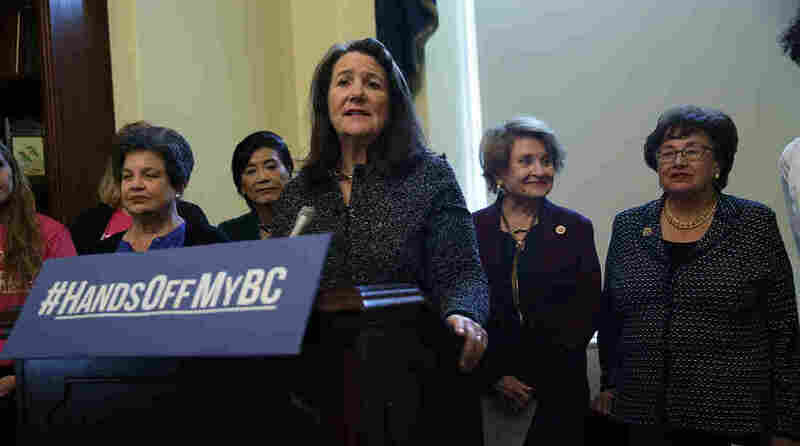 "I am so excited about this new class," Rep. Diana DeGette, a Colorado Democrat and co-chair of the Congressional Pro-Choice Caucus, told reporters at a Jan. 15 news conference. "We are systematically going to reverse these restrictions on women's health care." Indeed, the House has taken its first steps to do just that. On its first day of work Jan. 3, House Democrats passed a spending bill to reopen the government that would also have reversed President Trump's restrictions on funding for international aid organizations that perform abortions or support abortion rights. As one of his first acts as president, Trump re-imposed the so-called Mexico City Policy originally implemented in the 1980s by President Ronald Reagan. But the Senate, where Republicans still hold a slim majority, is not budging. If anything, Republican Senate leaders are trying to push further on abortion. On Thursday, Senate Majority Leader Mitch McConnell called a floor vote on a bill that would ban any federal funding of abortion or help fund insurance that covers abortion costs. Congress routinely adds the "Hyde Amendment" — a rider to the spending bill for the Department of Health and Human Services to bar federal abortion funding in most cases for Medicaid and other health programs — but McConnell's legislation would have made the provision permanent and government-wide. When the House was under GOP control, it passed similar measures repeatedly, but those bills haven't been able to emerge from the Senate, where 60 votes are required. In the end, McConnell's bill Thursday got 48 votes, 12 short of the number needed to move to a full Senate debate. Organizations that oppose abortion were thrilled, even though the bill failed to advance. "By voting on the No Taxpayer Funding for Abortion Act, the pro-life majority in the Senate is showing they'll be a brick wall when it comes to trying to force taxpayers to pay for abortion on demand," says a statement from the Susan B. Anthony List. The Senate action Thursday was clearly aimed not just at House Democrats' boast that they would vote to overturn existing abortion restrictions, but also at the annual anti-abortion "March for Life" held in Washington on Friday. remarks on the bill, noting that they "will speak with one voice on behalf of those who cannot speak for themselves." But these first two votes are just a taste of what is likely to come. At a breakfast meeting with reporters Jan. 16, DeGette, newly installed as chair of the oversight subcommittee of the House Energy and Commerce Committee, said that reproductive issues would be a highlight of her agenda. Meanwhile, Rep. Barbara Lee, D-Calif., the other co-chair of the Pro-Choice Caucus, and Nita Lowey, D-N.Y., the first female chair of the House Appropriations Committee, announced they will introduce legislation to permanently eliminate both the Hyde Amendment and the Mexico City Policy. In an odd twist, the abortion language in the Mexico City Policy bill passed by the House this month was taken directly from a version approved last June by the Senate Appropriations Committee. Republican Sens. Susan Collins of Maine and Lisa Murkowski of Alaska, who generally support abortion rights, joined with the committee's Democrats to approve an amendment overturning the policy in the spending bill for the State Department and other agencies. The full Senate never voted on that bill. Still, neither side is likely to advance their cause in Congress over the next two years. The Republican leadership in the Senate can block any House-passed bills lifting abortion restrictions. But the Senate, while nominally opposed to abortion rights, doesn't include 60 members who would vote to advance further restrictions. Where things get interesting is if either chamber tries to strong-arm the other by adding abortion-related language it knows will be unacceptable to the other side. That is exactly what happened in 2018, when the Senate was poised to pass a bipartisan bill to help stabilize the Affordable Care Act's insurance exchanges. House and Senate Republicans proposed a version of the bill — but with the inclusion of a permanent ban on abortion funding. Democrats objected and the bill died. Sen. Patty Murray,D-Wash., who was one of the senators engineering the original bipartisan effort, said at the time, "This partisan bill ... pulled the most worn page out of the Republican ideological playbook: making extreme, political attacks on women's health care." It is not hard to imagine how such an abortion rider could be used by either side to squeeze the other, as Republicans and Democrats tentatively start to work together on health issues such as prescription drug prices and surprise out-of-pocket bills. Abortion-related impasses could also stall progress on annual spending bills if House Democrats keep their vow to eliminate current restrictions like those limiting self-paid abortions for servicewomen or imposing further limits on international aid. Abortion fights on unrelated bills are almost a certainty in the coming Congress, said Ross Baker, a professor of political science at Rutgers University. He noted that abortion not only complicates health bills, but also sank a major bankruptcy bill in the early 2000s. "The only question is how it will emerge," he said. "And it will emerge." Kaiser Health News is a nonprofit news service covering health issues. It is an editorially independent program of the Kaiser Family Foundation that is not affiliated with Kaiser Permanente. You can follow Julie Rovner on Twitter: @jrovner.